The problem with most modern horror films is that they’ve stopped trying to scare you; they want to gross you out instead with elaborate and explicit torture and killings. The Saw franchise, and even the repugnant Human Centipede movies seem to pride themselves on just how many times you have to turn away in sheer disgust at what’s unfolding on screen. 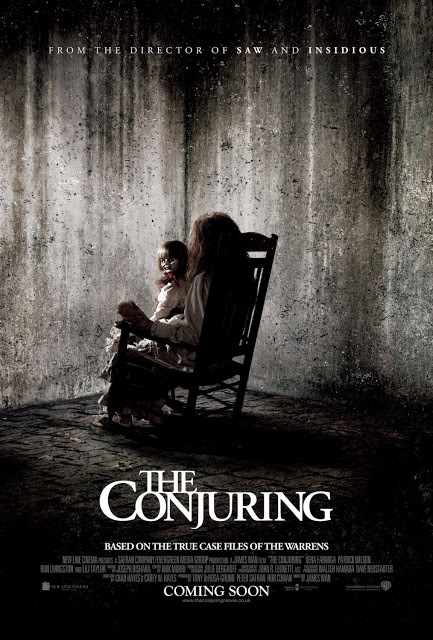 It takes a film as old fashioned and as classically structured as The Conjuring to remind us that it’s the little things that can deliver the biggest scares. Claiming to be based on a true-life story, the film stars Patrick Wilson and Vera Farmiga as married couple Ed and Lorraine Warren, a pair of ghostbusters renowned for their extensive research on the supernatural, and for the success they’ve had ferreting out spirits from where they don’t belong. In 1971, they’re recruited by Roger and Carolyn Perron (Ron Livingston and Lili Taylor), who, after moving into their new home in Rhode Island, find themselves and their five daughters being terrorized by strange smells, unexplained bruises, and visions of dead people. Director James Wan, who gave us the first Saw film, uses the camera niftily to create an eerie sense of foreboding, and employs music and sound effects shrewdly to heighten the shock. It’s true we’ve seen creaking floorboards and dusty basements a thousand times before, but he knows just how to exploit them for maximum effect. I’m not easily scared, but more than once during The Conjuring I found myself jumping in my seat. The film also works because there’s a level of acting here that’s rarely seen in films like this. Lili Taylor cuts a sympathetic figure as a helpless mother, and Vera Farmiga is nothing short of terrific as a woman whose special abilities make her both powerful and vulnerable. Sure the last half hour feels heavily borrowed fromThe Exorcist and Poltergeist, but it’s all done with such style, you’ll forget you’ve seen it before. The Conjuring. It’s a nice throwback to the moody horror films of the 70s. Wear long sleeves when you go to the cinema, or you risk your date digging her nails into your arm.